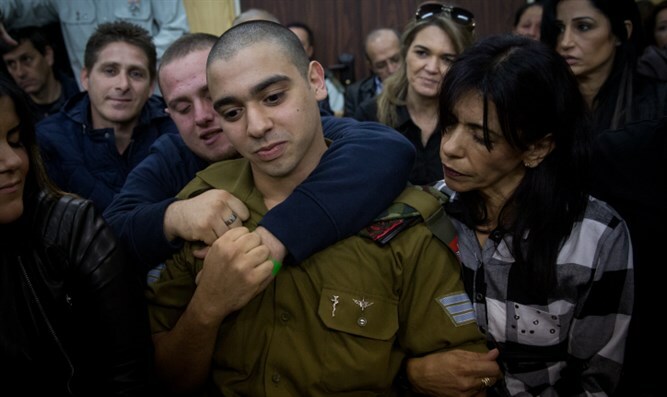 New poll shows just 19% of Israelis oppose pardon of IDF soldier convicted for death of Arab terrorist. Less than 24-hours after Sgt. Elor Azariya was convicted of manslaughter in the death of an Arab terrorist killed following a stabbing attack in Hevron in March of last year, several polls are already showing a majority of Israelis support a presidential pardon for the soldier – and that a majority disagree with the court’s ruling on Wednesday. The latest poll, conducted by the Gal Hadash survey group on behalf of Israel Hayom shows that a whopping 70% of Israelis believe Azariya should receive a full pardon, compared to just 19% who say he should not. Eleven percent had no opinion on the matter. An earlier poll, conducted by the Midgam Research Institute in conjunction with iPanel shows similar levels of support for a pardon, with 67% of Israelis saying they favored a pardon, compared to 19% who oppose. The Midgam poll also shows that 51% of Israelis say they disagree with the verdict, compared to 36% who agreed with it.